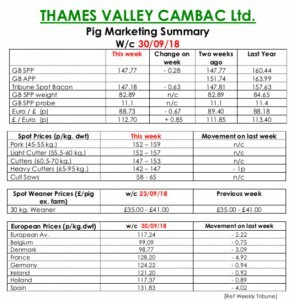 This week’s Slaughter Pig Marketing Summary from Thames Valley Cambac reported that supply improved slightly again, giving credence to recent reports of better growing conditions on farm. Some of the majors complained of poorer demand, and all with a weekly price contribution took the opportunity to reduce by a penny or two. All pigs were placed however, indicating a decent undercurrent to demand. The fresh meat market was steadier with many frustrated that high street sales had failed to materialise. It is hoped that the end of the month will see pay-packets hitting households and giving a much needed boost to demand. The cull sow market was a welcome stand on indicating a touch of stability on the continent. In Europe, the influential German market stood on, as did Belgium and Holland, but France Spain and Denmark were all lower. All quotes in sterling were further eroded by a weaker Euro that ended the week down 0.67p at 88.73p. The Weaner Marketing Summary, for week commencing September 23, reported that demand remained very poor, with ample supplies of both 7kg weaners and 30kg stores being offered. The calendar weighed heavily on sentiment in the 30kg market with 30kgs purchased now, growing on to become end of December bacon. 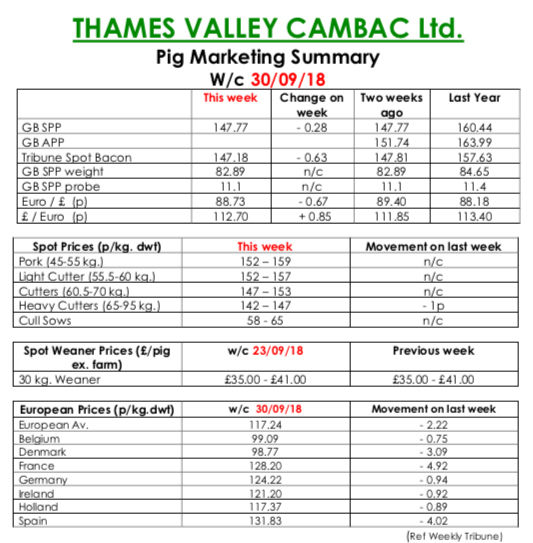 The prices announced by the AHDB saw the weighted average for a 30kgs pig rise by £4.18 to £55.16 and the weighted average for a 7kg fall by 51p to £34.50.